Can he buck the world No 1 trend? World No 1 heading into The Masters, Justin Rose, is a South African-born Englishman and a big fan favourite, writes GARY LEMKE. South Africans just love a home boy doing good in another country. One can go along with the narrative when it comes to those who were raised on African soil – and when digging around, the list runs deep – and went on to represent another country at sport. However, sometimes the link is tenuous, at best, which makes one wonder if other countries share the same habit. Did the South China Morning Post, for instance, constantly remind its readers that ‘Hong Kong-born Bruce Fordyce has won another Comrades Marathon’? Or in the late-1990s, did Zimbabwe’s Herald keep banging the drum that ‘Gweru-born Gary Teichmann captained the Springboks to a world-record 17 consecutive Test wins, including beating the All Blacks in New Zealand’? Does the tennis world constantly remind everyone that Roger Federer’s mother is originally from Kempton Park, or that four-time Tour de France winner Chris Froome is ‘South African’ because he was born in Kenya, but was moved to South Africa at the age of 14 before his family relocated to England? So, as they say, wherever you are in the world, lift up a rock and you’ll find a South African under it. In terms of golf, given its rich history, South Africa hasn’t had to ‘re-claim’ foreign nationals owing to the success the sport has enjoyed at the highest level over the years. However, the conveyor belt supplying Major champions has been under construction since 2012 when Ernie Els picked up the fourth of his Majors by winning The Open Championship at Royal Lytham & St Annes. Louis Oosthuizen, in particular, has come closest to adding to the tally, while Branden Grace is another who has been knocking on the door, and one can never discount Charl Schwartzel rediscovering the form that saw him win the 2011 Masters. Yet, when it comes to this year’s Masters, every South African will be adding Justin Rose to the ‘home contingent’. He may well be the country’s best hope of winning another Green Jacket. Born in Johannesburg to English parents in 1980, the family moved to England when he was five. That is still good enough for many to call him an honorary South African. Not that Rose can remember much about the move. Having spent time in South Africa, his parents dived straight into the business of selling swimwear. Yes, swimwear in England. ‘All I remember are swimsuits, leotards and fitness gear kicking about,’ Rose told the Telegraph. Rose has always been one of those golfers who is impossible not to admire and respect. He burst on to the scene as a 17-year-old amateur at The Open at Royal Birkdale, where he finished fourth in 1998, some 21 years ago. A lifetime ago. He turned professional on the back of a tidal wave of expectation, but quickly learned that this great game can bring the best to their knees. He missed the cut at his first 21 events as a pro before finally striking the jackpot when winning for the first time in 2002, fittingly at the European Tour’s Alfred Dunhill Championship in Johannesburg, where it all started for him. His debut pro victory on ‘home soil’, as it was reported at the time. The young golfer cut an emotional figure that Sunday in mid-January at Houghton Golf Club. ‘My dad’s not so well and he is the guy I owe most to. He’s put a lot of time, a lot of hours into my game. This win is for him more than anybody,’ the then 21-year-old told the media. His father, Ken, was battling leukaemia and was unable to share his son’s breakthrough success. Eight months later Ken, his son’s mentor, coach, analyst and trusted friend, passed on. He was 57. However, his memory continues to live on and Rose has become one of the wealthiest golfers on the planet, sitting in sixth position on the list of all-time high earners, with more than $51-million in prize money across all Tours. Above him are Tiger Woods, Phil Mickelson, Vijay Singh, Jim Furyk and Dustin Johnson. Rose has 23 individual career victories, has been part of five European Ryder Cups, tasting success in three of them, and won the gold medal at the 2016 Rio Olympic Games wearing the flag of Great Britain. While other golfers, male and female, had withdrawn from the Games, citing concerns over the Zika virus – which were later proved unfounded – Rose teed up in Brazil. ‘There was a misunderstanding among some of us about what the Olympics meant. For me, whenever you represent your country, you try to be the best version of yourself. Even when I was playing England amateur golf, the minute you put on a shirt with the crest on it, there’s something about it that makes you look back on everything you have learned and bring it to the fore,’ he said in a thinly-veiled jibe at those who had turned their backs on playing for their country in Rio. And that’s about as controversial as Rose gets. Whenever he is questioned about ‘being South African’, he is polite. At the 2007 Masters, Rose’s coach, Nick Bradley, urged him to remember his roots. ‘I didn’t say to him, “Let the English come out in you,”’ said Bradley. ‘I said to him, “Justin, just remember Gary Player. Let the South African come out.”’ He held the first-round lead and was one shot off the pace with two holes left on the last day when he made a mess of his drive on the 17th. ‘There’s no doubt about it,’ said Rose. ‘When I write down my goals at the beginning of the year, getting into the Nedbank Golf Challenge is always the benchmark of having a really great year,’ he said at the time. That was then, this is now. He heads into The Masters as one of the obvious favourites, and we’ll only know closer to the time whether or not it is as the No 1-ranked golfer in the world, a position he has been swapping with Americans Dustin Johnson and Brooks Koepka ever since reaching the pinnacle last September after winning the BMW Championship in Philadelphia. Being No 1 is not necessarily a good thing, because history hasn’t been kind to those teeing up at Augusta as the top-ranked golfer in the world. In fact, one needs to go all the way back to 2002 when a certain Tiger Woods held off Retief Goosen for the Green Jacket. Since then, 16 years have come and gone while the incumbent world No 1 at the time has been unable to convert that into victory. At the time of writing, in early March, Rose had slipped behind Johnson again, back to No 2 – which would be a good thing, given any superstitions around recent history. For Rose, reaching No 1 was the fulfilment of a dream. It came on the 16th anniversary of his father’s death. ‘We did it Dad… World Number 1. Thank you so much to my family, friends and everybody who has helped me achieve this incredible goal,’ he tweeted, along with a photo of him pointing to the sky taken after winning what is so far his only Major, the 2013 US Open at Merion GC. He has twice come close at The Masters, finishing tie-second with Phil Mickelson, four shots behind Jordan Spieth in 2015, before losing in a playoff in the gloom to Sergio Garcia in 2017, when he bogeyed the first extra hole (the 18th) to the Spaniard’s par. It was Garcia’s first Major in his 74th attempt. How did Rose react? ‘If there’s anyone to lose to, it’s Sergio. He deserves it. He’s had his fair share of heartbreak.’ As much as money drives the professional game, Rose finds another word for what matters most to him. ‘Legacy,’ he told the Telegraph. ‘I’ve always been a player more interested in finding a place in the game than making money. I’m a history books guy. And I feel like there is more to give. A career grand slam is what would blow me away. It’s a chilling, yet refreshing statement of intent, at a time when the 38-year-old could easily hand over to the twentysomethings taking over at the sharp end of the sport. Especially given that he needed to rest his back for six weeks after last year’s Ryder Cup, before opting for another break after missing the cut at the Saudi International – won by Johnson – and reappearing a few weeks later at the Arnold Palmer Invitational. So, where is ‘home’ for the Rose family? Literally and geographically it’s the Bahamas, where he owns a sprawling ranch. The family also have a house in Putney alongside the River Thames, near Fulham football ground, although Rose is a committed Chelsea FC fan when it comes to his English Premiership interest. But he will never deny his South African roots or turn his back on a country where he spent some of his formative years. That’s not to say he is South African – although there’s no harm in adding him to the list of Oosthuizen, Grace, Schwartzel, Trevor Immelman and Jovan Rebula as the ‘sixth Saffa’ in the mix when they tee it up at The Masters in this year’s first men’s Major. 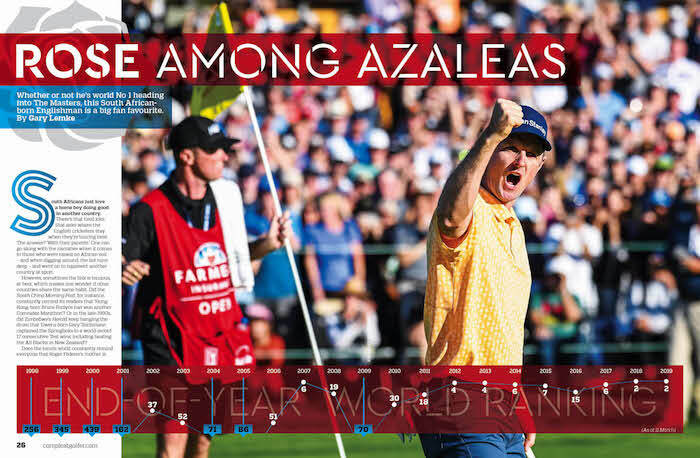 – This article appeared as the cover feature of the April issue of Compleat Golfer, now on sale!